Your WordPress installation consists of WordPress Core, a theme, and usually one or more plugins. Unfortunately sometimes these aspects conflict with each other, therefore we want you to test if your problem still exists in a controlled environment. This will help you identify the correct team of experts to report the issue. Having the right teams working on the issue is a benefit to you. We highly recommend using the Health Check plugin as it allows you to run a conflict check without affecting normal visitors to your site. However, if you cannot install plugins, please use the alternative option. Can I Just Deactivate Yoast SEO? The fastest way to rule out conflicts is to deactivate all non-Yoast plugins and switch to a standard theme like Twenty Seventeen. If this resolves the issue, you have a conflict and should activate one plugin at a time until you locate the conflict. Finally, after all plugins are active, switch to your theme. This will narrow down the conflict to a specific plugin or a theme conflict. 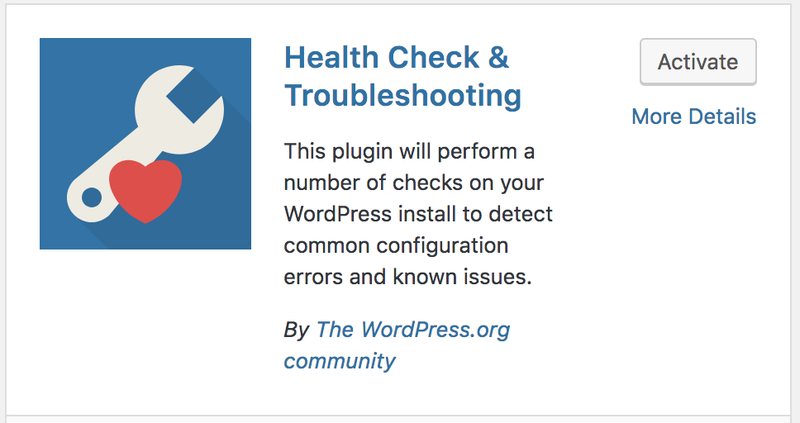 The steps below will walk you through the process using the Health Check & Troubleshooting plugin. Type ‘Health Check & Troubleshooting’ in the search bar, as shown below. This will give you a page of search results. The Health Check & Troubleshooting plugin should be visible now. Click the ‘Install Now’ button. Click the ‘Activate’ button that appeared where the ‘Install Now’ button was previously located. On the left-hand side, click on ‘Dashboard’ at the top. The ‘Dashboard’ menu will expand providing you additional options. Click on ‘Health Check’. There are multiple tabs which provide a lot of information about your website and server setup. If you see errors on the ‘Site Status’ or ‘Debug Information’ tabs, please resolve the issues before continuing. Click on the ‘Troubleshooting’ tab, read the warning information, and click ‘Enter troubleshooting mode’. Reproduce the issue you were experiencing. If the issue occurs, this means our plugin is not causing the unexpected behavior. The ‘Dashboard’ menu will expand providing you additional options. Click on ‘Home’. Under ‘Available Plugins’, click ‘Show all plugins’ and ‘Enable’ next to Yoast SEO or Yoast SEO Premium. If the issue occurs,the issue is caused by our plugin. Please hover over ‘Troubleshooting Mode’, click ‘Disable troubleshooting mode’ and click here for advice. Under ‘Available Plugins’, click ‘Show all plugins’ and ‘Enable’ on the first disabled plugin. If the issue is related to a Yoast add-on, please enable Yoast plugins before other plugins. If the issue occurs, Yoast SEO conflicts with the plugin you just activated. Please hover over ‘Troubleshooting Mode’, click ‘Disable troubleshooting mode’ and click here for advice. If not, repeat the steps to activate the next disabled plugin until are plugins are active and then continue. Under ‘Available Themes’, click ‘Show all themes’ and ‘Enable’ on your preferred theme (or the parent theme, if using a child theme). If the issue occurs, Yoast SEO conflicts with your preferred theme.Please hover over ‘Troubleshooting Mode’, click ‘Disable troubleshooting mode’ and click here for advice. If not and you have a child theme, repeat the steps to enable and test the child theme. The fastest way to rule out conflicts is to deactivate all non-Yoast plugins and switch to a standard theme like Twenty Seventeen. If this resolves the issue, you have a conflict and should activate one plugin at a time until you locate the conflict. Finally, after all plugins are active, switch to your theme. This will narrow down the conflict to a specific plugin or a theme conflict. The steps below will walk you through the process. Switch to an unaltered default WordPress theme like Twenty Seventeen. If the issue occurs, this means our plugin is not causing the unexpected behavior. Click here for advice. If the issue does not occur, continue to the next step. Activate only Yoast SEO or Yoast SEO Premium. If the issue occurs, the issue is caused by our plugin. Click here for advice. Activate one of the previously active plugins. If the issue is related to a Yoast add-on, please enable Yoast plugins before other plugins. If the issue is related to specific plugin feature, activate this plugin before other plugins. If the issue occurs, Yoast SEO conflicts with the plugin you just activated. Click here for advice. If not, repeat the steps to activate the next inactive plugin until are plugins are active and then continue. Activate your preferred theme (or the parent theme, if using a child theme). If the issue occurs, Yoast SEO conflicts with your preferred theme. Click here for advice. As much as we’d love to help, the issue is not caused by our plugin. This may be a WordPress issue, a conflict with your specific setup or something related to your server or webhost. Opening a topic in the WordPress support forums may help point you in the right direction. If you were using the Health Check plugin, please hover over ‘Troubleshooting Mode’ and click ‘Disable troubleshooting mode’. This will, also, automatically disable when you log out of your WordPress admin account. Please file a bug report for our development team. Please file a bug report for our development team. As the issue is a conflict with another plugin or theme, we highly recommend reporting the issue to the development or support team of the other plugin or theme. Having both teams work on the issue is a benefit to you. Yoast settings are stored in the database and are saved when you deactivate Yoast plugins. Deactivating other plugins or changing themes should not cause you to lose any settings, however, we cannot guarantee it. For the health and safety of your site, we recommend making a complete backup of your website. This simply provides you with a safety net in the event something doesn’t reset correctly. Why Can’t I Just Deactivate the Yoast plugin? If you’re reading these steps, something has already failed within Yoast so deactivating Yoast plugins won’t provide the full picture. Our development team must be able to reproduce the issue in order to provide an accurate solution. The Health Check plugin used above allows you to run a conflict check without affecting normal visitors to your site. However, we understand if you wouldn’t want to deactivate your plugins and switch themes on a production site, so it may be preferable that you set up a staging environment for your tests. Some popular web hosts offer quick setups for a staging site so please contact your web host for assistance. If your web host does not offer staging sites, this article will help you create a staging site.